It may be a cliché, but when one door shuts, often another, better one opens. Adam talks about a friend, a retired Marine, who tried something totally out of character and has now not only made a business from it but derives great pleasure from it. Volunteering is a great way to reengage in the world and to be with other veterans with similar issues from TBI, says Adam. Whether going on a fishing or camping trip, volunteering offers a way to bond with others like you and have fun, too. "I've been there ... it's hard!" Adam knows that it's difficult to feel motivated to participate in one's own recovery when the progress seems slow; it's hard to jump in the saddle to get on with your life. He offers support and strategies that work. Adam talks about a friend who runs an art therapy program for vets with TBI and PTSD. "It's a place where you can express yourself in a safe, self-paced environment. 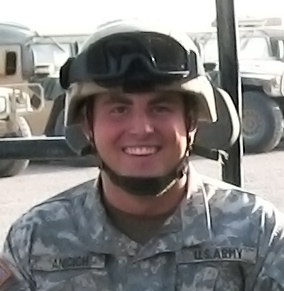 A place to be with other vets in a quiet, relaxing setting," explains Adam. Should you jump in and finish a sentence for someone with TBI who is having trouble speaking or trying to form a word? Should you drop eye contact if the person is struggling? Adam talks about how to respectfully interact with someone with a TBI. Searching for a job can be frustrating — and exhausting, especially for veterans with TBI. Adam gets some good ideas from Army veteran William Marquez, Virginia Employment Commission. "Veterans make great employees," Army veteran William Marquez, Virginia Employment Commission, explains to Adam. Prospective employers should focus more on the veterans' hard work, discipline, and skill level and less on any disability they may have. Adam talks with Army veteran William Marquez, Viriginia Employment Commission, about how to help veterans get the necessary licenses, certifications, and training they need to enter the civilian workforce.